Scott Hensey has been in the toy sculpting business for decades – chances are, you’ve owned at least one of his creations over the years. While a familiar name in the toy industry, fans and collectors have recently come to know Scott better through his videos with Make magazine. Scott graciously agreed to an interview with PoeGhostal.com. You can visit his website and see lots of photos of his creations, as well as contact him for potential sculpting projects, at toysculpt.com. 1.) How did you get started in the business? I’ve always made my living as an artist. I started after high school building stained glass panels, making screen prints and throwing pottery. I got a job at a company that made plaster statues. I made hundreds of different pieces for them. After that I got a great job at Tomy Toys in Los Angeles. When that place closed down I went freelance as a toy sculptor. 2.) How do you approach working on an action figure as opposed to, say, a statue or a Happy Meal toy? Action figures are usually articulated so the armature is where I start. Once I know how the figure should look I plan the pose and the articulations. Then it becomes about getting the figure to look alive, not easy. 3.) What are some of your favorite sculpts that you’ve worked on (particularly action figures)? I have lots of favorites, The Turtles were a lot of fun of course. Baxter the fly man, Shredder and the Foot Soldier come to mind. They were fun because we were making it up as we went. I did some cool Judge Dredd figures for Mattel that never got made. I enjoyed doing the Jonny Quest figures for Galoob. The Skeleton Warriors were extra work but very satisfying because they were so well received. Monster [Force] for Playmates was a good gig – I got to do a Creature from the Black Lagoon figure among others for that line. And then there was Kong, a giant gorilla – what’s not to love? 4.) 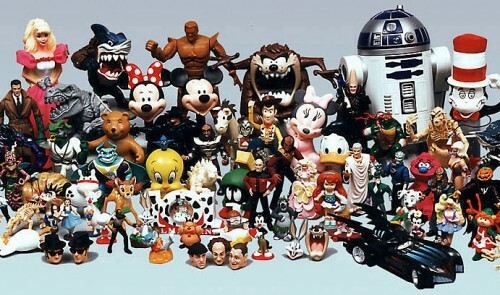 How has the toy industry changed since you started? When I started Toys R Us had five aisles devoted to action figs. I could have worked around the clock and not got all the work done. These days kids don’t care much for figures, they play with video games now. 5.) What are you working on these days? I take a toy job or two these days as often as I can but mostly I’ve been doing a lot of Ceramic giftware for Lenox Ceramics, Mickey Mouses and Charlie Browns. It’s fun, it’s ALMOST artwork, but it ain’t toys. I did some cool Insect Masks for Insect Lore that should be coming out soon. And Playmates brought me in to do a figure for the new Turtles line called DogPound. 6.) Is there anything else you’d like to let our readers know about? I’d like to express to your readers that I am very grateful that they remember my work since I never sign anything. I’m going to continue freehand sculpture as long as I can find clients who appreciate my hands on approach. Just call me John Henry. we need these old hands at the till… i think a lot of the modern "lack of interest" from kids stems from sub-par figures. And super-dee-duper technology. But yeah, sub-par stuff is definitely a big factor in it. Wow! I loved Skeleton Warriors, the Johnny Quest Line, and Monster Force. I'm interested to learn more about the never released Judge Dredd line: I have the Mega Force Judge Dredd figures (love those guys still) and the Cyberforce figures. Interesting to think Mattel had a full line planned. I also have Dogpound from TMNT, also. While the paint is weak, the sculpt is great. Cool to hear from someone who helped to craft my childhood in so many ways! They all look great, I would really like to buy some is there an amazon link?